A Slick Idea: The ROC Barrier signals a cost-effective shift in the way oil spills are managed. Just as we start our conversation, Glenn Murray is called away from the phone. His courier has arrived. His company, Murrenhil Corporation, is shipping 8,000 feet of his oil collection system to California and 4,000 feet to Florida to his client, Disney Cruise Lines. The product, a specialized laminate film called the ROC Barrier, uses a technology that has been around for many years, but in a new profile that Murrenhil has designed. “We developed a product that corrals and contains oil in open water, and we patented the buoy system that contains the barrier,” Murray explains. Not only does the barrier contain the oil, it does so economically and with great speed. At less than a dollar per foot, the barrier can be deployed using a small boat at up to 57 kilometres per hour, preventing oil from contaminating shorelines and sensitive wetlands. It’s also portable—a standard 1,000-foot roll of product is only six inches in diameter and requires one-twentieth of the storage space required by similar materials currently used in the oil spill control industry. 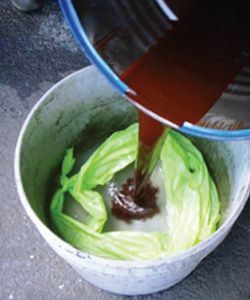 In addition to its compact storage capability, the film is capable of adsorbing the spilled oil it is intended to contain. Murray’s innovation has already won his company three awards in the City of Kawartha Lakes, Ontario—the Innovation Award, the Environmental Initiative Award, and, closest to Murray’s heart, the Hero of the Year Award, which came as a result of his work in the Gulf Coast during the Deepwater Horizon spill. He gave 30,000 feet of barrier boom to help protect the waterways inside the bayous near Grand Banks, Louisiana. While the barrier could revolutionize marine emergency spill response, it could also be used on small and large scales to contain damage to marine environments all over the world. Murray sees applications for marinas, ships, watercraft, ports, harbours, shipping lanes, beaches, lakes, waterfront resorts, and water conservation areas. In the event of an oil spill, these clients could deploy the ROC Barrier quickly to contain the mess and prevent some of the potential consequences for animals, habitat, and property.